Suitable for Black Friday a few trading tips from the Barter Kings! 1. Scan the trades. Keep an eye on [...] bartering sites for potential solid deals. 2. Always look over your shoulder. There are a lot of scammers out there. If something smells fishy, don’t go fishing. 3. Trading isn’t something you should just dive into. There are a lot of sharks out there that could take advantage of a novice. Start small either with lower cost items, or practice by trading with friends and using local papers. 4. You don’t have to be an appraiser, but you have to know your item. Your best strategy in a trade is your knowledge on the item. If you don’t know about it, don’t trade with it. If you know someone who appraises, bring them to your trade, if not, a smartphone works just as well. Just jump on eBay and you can get your answers. I use the site to check the prices that items are selling at. Retail and wholesale mean nothing in my world. I don’t deal with mall prices. 5. Always keep a good poker face. The less reaction you show in a trade, the more of a chance you have of gaining the upper hand and trading up. 6. Negotiating is learned through practice. Like anything else, the more you do it, the better you will be at it. Books like “The Art of Negotiation” help to get a good grasp on learning how to talk the talk. 7. Never bring cash to a trade. 1. Decide if you are going to start a trade for a specific goal/item or just to see what you can accomplish. If you are just doing it to see what you can accomplish, than don’t put pressure on yourself and just have fun. You will be amazed at how far you can get. 2. The most popular and effective website is Craigslist. It just reaches more people than other sites. But you can use a search engine to find bartering websites for your location – a lot of these sites are great. 3. People always like to mention what their item sold for when it was brand new. Even if they got 50% off, they only mention what it was selling for at full retail price when it was new. You have to learn to address this issue quickly and effectively. If someone is willing to trade an item, they do not see a value in keeping it. You have to figure out that reason and justify the trade from there. Sometimes it is easy and sometimes not so easy. 4. If you want to take a trade string far, you can’t always worry about the exact value of an item. Trade value is way different than actual value. If I’m planning on making a trade string work, I like to start with items that people can’t shop a value for – unique items, rare items, or hard-to-get items. I want to trade to an item that I know could be hard to move because I can get it easier if the other trader has had a problem trading or selling the item. When I find the right person to trade it to and they can’t put an exact value on the item, it helps me make bigger value jumps and I can do less trades. But it is harder to do fast and takes patience. 5. When I post something for trade, I make sure to take good photos and be specific about details, but I leave out some information so that the person who is interested will call me. Then I can see where I can go with the trade. In this current recession, we are seeing bartering and the barter system making a comeback. Many people are experiencing great financial difficulties and job losses. Some of these people are getting themselves further into debt to get the items they need, but modern survivalists are turning to the barter system. Many of us have heard of the term ‘barter’, but if you’re like most people, the image that comes to mind is that of a poor farmer paying the small town doctor for his clinical services with one of the chickens from his farm. Webster’s dictionary tells us the definition of barter is to trade by exchanging one commodity for another. Bartering systems have been around in most cultures since before money was created. For example, during the colonial era, money was scarce so the colonists used bartering as a primary means of procuring the goods or services they needed. They would trade such items as musket balls, tobacco, beaver pelts and deer skins. By the way, the later is where we derived our modern slang term ‘buck’, meaning ‘dollar’. People who had items or services to sell would exchange them with others for the things they needed. It allows you to use the items you no longer need to get the items you do need. A good prepper knows this, and is another reason to store extra items…to use as barter items! Good negotiating makes the barter system work at its best. 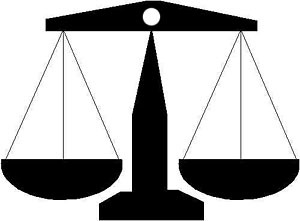 A good negotiation means both parties feel they have made a good deal and will walk away happy. One thing to bear in mind concerning the barter system is that you don’t have to be trading items. Perhaps you are a plumber and your neighbor works as an automotive mechanic. Your truck needs a brake job and your neighbor has a dripping water leak somewhere underneath the kitchen sink. After a little chatting and negotiating, you’ve got a fair trade. Everyone has a service they can barter, just be creative. Ladies, perhaps you are a hair stylist, massage therapist or caterer. These are all services that you can barter. Maybe you are a housewife that loves paper crafting as a hobby. You can make wedding invitations or thank you cards for your neighbor, the hair stylist, who is getting married in exchange for hair cuts, the number of which to be determined during your negotiations. Use your skills. You likely have unique skills that you don’t even realize are of value to others! Bartering also makes for good neighbors. In our neighborhood, talking with people we already knew, led us to other neighbors with talents we were looking for, but we hadn’t made their acquaintance yet. Word of mouth truly can be the best advertising. When times are difficult, your local community and neighborhood can be your best asset. Be creative, utilize your talents and items you no longer want or need, to obtain the same from others. BARTER! It’s beneficial for everyone involved! 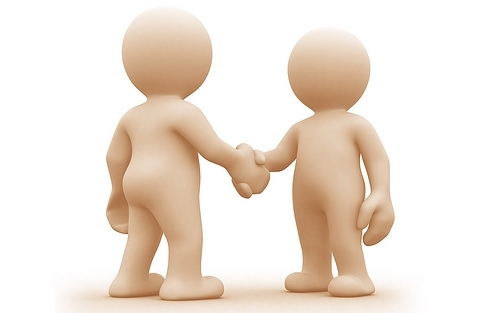 Bartering is the exchange of goods or services for the goods and services offered by someone else. Money typically doesn’t change hands, provided the value of the exchange is deemed equivalent. Bartering can be a good way to get experience when you’re just starting out, fulfill a need without a financial investment, expand your network and find new business. While it can seem like an informal situation, there are potential damaging consequences that can occur if you don’t do certain things to protect the bartering arrangement. 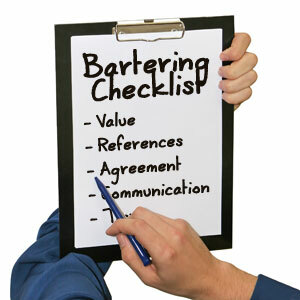 Here is a checklist of the most important steps you should take before beginning a bartering relationship. 1. Reconnect with past customers or clients. Every company loses a certain number of customers over time, for no particular reason. Some people will just drift away or forget about you. If you contact them (either in person, or by phone, mail or email) and tell them that you’ve missed them, then offer them a special deal to reactivate the relationship, many of them will take you up on it. 2. Dedicated referral systems. Most business owners cross their fingers and hope their customers will recommend them to friends and family. Smart business owners make it easy for them to do so by giving them a self-serving reason to, such as discounts, bonuses and referral fees. 3. Make irresistible offers. Contact everyone who does business with you and tell them that, in honor of a special occasion, you’re making them a limited-time special offer. If you don’t have such an occasion, make something up. Just be sure to give a plausible reason for the offer. 4. Raise your prices. This sounds scary, but it doesn’t have to be. You can test a different price point on a small segment of your customer base to see how it goes over. If you get a positive response, you can safely expand it to the rest of your list. 5. Get other businesses to endorse your products or services. Find businesses related to, but not in direct competition with yours. Convince them to endorse you to their client list in exchange for either a percentage of profits or a flat fee. They should be agreeable to this because you’re opening up a new profit center for them, at no cost and with very little effort. Who wouldn’t like the sound of that? 6. Exploit your underutilized assets. Do you have equipment, office or warehouse space, or employee man hours that you’re not using to their full capacity? If so, there are probably a lot of companies out there that would be happy to pay you to rent them from you. 7. Barter. Bartering your products or services can benefit you in two ways: One, you can barter for essential services, thus cutting your overhead; and two, you may be able to barter for products that you can then turn around and sell. Just remember, though, that the IRS regards barter arrangements as taxable income.